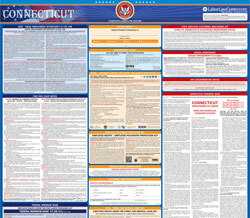 The Connecticut Wage & Workplace Administrative Regulations is a general labor law poster poster by the Connecticut Department Of Labor. This is a mandatory posting for all employers in Connecticut, and businesses who fail to comply may be subject to fines or sanctions. This poster must be posted in a conspicuous place where all employees will see it. This poster describes the standards of wages and workplaces including minimum wage for adults and minors, how overtime is calculated, how employers should keep records and how employers have to deal with apprentices. It appears you don't have a PDF plugin for this browser. Please see the link below to download connecticut-dol-75.pdf. PAY AFTER  40  HOURS  PER  WEEK. OF THE APPLICABLE MINIMUM WAGE. 85% OF THE APPLICABLE  MINIMUM WAGE. WAGE AS DEFINED IN SECTION 31-58. Sec. 31-60-1. Piece  rates  in  relation  to  time r a t e s   o r   i n c e n t i v e   p a y   p l a n s ,   i n c l u d i n g commissions and bonuses. (a)  Definitions. For  the  purpose  of  this  regulation, “piece  rates”  means  an  established  rate  per  unit  of work  performed  without  regard  to  time  required  for such  accomplishment. “Commissions”  means  any premium  or  incentive  compensation  for  business transacted  whether  based  on  per  centum  of  total valuation or specific rate per unit of accomplishment. “Incentive plan” means any method of compensation, including,  without  limitation  thereto,  commissions, piece rate, bonuses, etc., based upon the amount of results produced, where the payment is in accordance with  a  fixed  plan  by  which  the  employee  becomes entitled  to  the  compensation  upon  fulfillment  of the  conditions  established  as  part  of  the  working agreement,  but  shall  be  subject  to  the  limitation hereinafter set forth. (b) Record of wages. Each employer shall maintain records  of  wages  paid  to  each  employee  who  is compensated  for  his  services  in  accordance  with an  incentive  plan  in  such  form  as  to  enable  such compensation  to  be  translated  readily  into  terms  of average hourly rate on a weekly basis for each work week or part thereof of employment. (c) Piece rates in relation to time rates:(1)  When  an  employee  is  compensated  solely  at piece  rates  he  shall  be  paid  a  sufficient  amount at  piece  rates  to  yield  an  average  rate  of  at  least the  minimum  wage  for  each  hour  worked  in  any week, and the wage paid to such employee shall be not less than the minimum wage for each hour worked. (2)  When  an  employee  is  compensated  at  piece rates for certain hours of work in a week and at an hourly rate for other hours, the employee’s hourly rate  shall  be  at  least  the  minimum  wage  and  his earnings  from  piece  rates  shall  average  at  least the minimum wage for each hour worked on piece rate for that work week, and the wage paid to such employee shall not be less than the minimum wage for each hour worked. (3) When an employee is employed at a combination of hourly rate and piece rate for the same hours of work  (i.e.,  an  incentive  pay  plan  superimposed upon  an  hourly  rate  or  a  piece  rate  coupled  with a minimum hourly guarantee), the employee shall receive  an  average  rate  of  at  least  the  minimum wage an hour for each hour worked in any week and the wage paid to such employee shall be not less than the minimum wage for each hour worked. (d)Commission. (1) When an employee is compensated solely on a  commission  basis,  he  shall  be  paid  weekly  an average  of  at  least  the  minimum  wage  per  hour for each hour worked. (2) When an employee is paid in accordance with a plan providing for a base rate plus commission, the wage paid weekly to the employee from these combined sources shall equal at least an average of the minimum wage an hour for each hour worked in any work week. All commissions shall be settled at least once in each month in full. When earnings are derived in whole or in part on the basis of an incentive plan other than these defined herein, the employee shall receive weekly at least the minimum wage  per  hour  for  each  hour  worked  in  the  work week,  and  the  balance  earned  shall  be  settled  at least once monthly. Sec. 31-60-2. Gratuities  as  part  of  the  minimum fair wage. For the purposes of this regulation, “gratuity” means a  voluntary  monetary  contribution  received  by  the employee from a guest, patron or customer for service rendered. (3)  Each  employer  claiming  credit  for  gratuities as  part  of  the  minimum  fair  wage  paid    to  any employee  shall  provide  substantial  evidence  that the  amount  claimed,  which  shall  not  exceed  the allowance hereinafter provided, was received by the employee. For example, a statement signed by the employee attesting that wages received, including gratuities  not  to  exceed  the  amount  specified herein, together with other authorized allowances, represents a payment of not less than the minimum wage per hour for each hour worked during the pay period,  will  be  accepted  by  the  commissioner  as “substantial evidence” for purposes of this section, provided  all  other  requirements  of  this  and  other applicable regulations shall be complied with. Sec. 31-60-3. Deductions  and  allowances  for reasonable  value  of  board  and  lodging  was repealed. Sec. 31-60-4. Physically or mentally handicapped employees. Sec. 31-60-6. Minors under the age of 18. (a) For  the  purposes  of  this  regulation,  “minor” means  a  person  at  least  16  years  of  age  but  not over  18  years  of  age. To  prevent  curtailment of  employment  opportunities  for  minors,  and  to provide  a  reasonable  period  during  which  training for  adjustment  to  employment  conditions  may  be accomplished,  a  minor  may  be  employed  at  a modification of the minimum fair wage established by  subsection  (j)  of  section  31-58  of  the  general statutes, but at not less than 85% of the minimum wage, for the first 200 hours of employment. When a minor has had an aggregate of two hundred hours of employment, he may not be employed by the same or any other employer at less than the minimum fair wage. (b)  In addition to  the records required by  section 31-66  of  the  1969  supplement  to  the  general statutes, each employer shall obtain from each minor to  be  employed  at  a  modification  of  the  minimum fair  wage  rate  as  herein  provided,  a  statement of  his  employment  prior  to  his  date  of  accession  with  his  present  employer. Such  statement  of prior  employment,  supplemented  by  the  present employer’s  record  of  hours  worked  by  the  minor while  in  his  employ,  will  be  deemed  satisfactory evidence of good faith on the part of the employer with respect to his adherence to the provisions of this regulation, provided such record shall be in complete compliance with the requirements of section 31-66 of the general statutes and section 31-60-12. (c) Deviation from the provisions of this regulation will  cancel  the  modification  of  the  minimum  fair wage herein provided for all hours during which the violation prevailed and for such time the minimum wage shall be paid. Sec. 31-60-7. Learners. For  the  purpose  of  this  regulation,  “apparel” means  uniforms  or  other  clothing  supplied  by  the employer for use in the course of employment but does  not  include  articles  of  clothing  purchased by  the  employee  or  clothing  usually  required  for health,  comfort  or  convenience  of  the  employee. An allowance (deduction) not to exceed $1.50 per week  or  the  actual  cost,  whichever  is  lower,  may be  permitted  to  apply  as  part  of  the  minimum  fair wage for the maintenance of wearing apparel or for the laundering and cleaning of such apparel when the service has been performed. When protective garments  such  as  gloves,  boots  or  aprons  are necessary to safeguard the worker or prevent injury to  an  employee  or  are  required  in  the  interest  of sanitation,  such  garments  shall  be  provided  and paid  for  and  maintained  by  the  employer  without charge upon the employee. (a)  For the purpose of this regulation, “travel time” means that time during which a worker is required or  permitted  to  travel  for  purposes  incidental  to  “a performance of his employment but does not include time spent traveling from home to his usual place of employment or return to home, except as hereinafter provided in this regulation. (b)  When  an  employee,  in  the  course  of  his employment,  is  required  or  permitted  to  travel  for purposes which inure to the benefit of the employer, such travel time shall be considered to be working time and shall be paid for as such. Expenses directly incidental to and resulting from such travel shall be paid  for  by  the  employer  when  payment  made  by the employee would bring the employee’s earnings below the minimum fair wage. (c) When an employee is required to report to other than his usual place of employment at the beginning of  his  work  day,  if  such  an  assignment  involves travel  time  on  the  part  of  the  employee  in  excess of  that  ordinarily  required  to  travel  from  his  home to  his  usual  place  of  employment,  such  additional travel time shall be considered to be working time and shall be paid for as such. (d) When at the end of a work day a work assignment at other than his usual place of employment involves, on the part of the employee,  travel time in excess of  that  ordinarily  required  to  travel  from  his  usual place of employment to his home, such additional travel time shall be considered to be working time and shall be paid for as such. (a)  For  the  purpose  of  this  regulation,  “hours worked” include all time during which an employee is required by the employer to be on the employer’s premises or to be on duty, or to be at the prescribed work place, and all time during which an employee is  employed  or  permitted  to  work,  whether  or  not required to do so, provided time allowed for meals shall be excluded unless the employee is required or permitted to work. Such time includes, but shall not be limited to, the time when an employee is required to wait on the premises while no work is provided by the employer. Working time in every instance shall be computed to the nearest unit of 15 minutes. (b) All  time  during  which  an  employee  is  required to  be  on  call  for  emergency  service  at  a  location designated  by  the  employer  shall  be  considered to  be  working  time  and  shall  be  paid  for  as  such, whether or not the employee is actually called upon to work. ( c )   W h e n   a n   e m p l o y e e   i s   s u b j e c t   t o   c a l l   f o r emergency  service  but  is  not  required  to  be  at  a location  designated  by  the  employer  but  is  simply required  to  keep  the  employer  informed  as  to  the location  at  which  he  may  be  contacted,  or  when an  employee  is  not  specifically  required  by  his employer  to  be  subject  to  call  but  is  contacted  by his  employer  or  on  the  employer’s  authorization directly  or  indirectly  and  assigned  to  duty,  working time shall begin when the employee is notified of his assignment and shall end when the employee has completed his assignment. (1)  His name;  (2)  his home address;v  (3)  t h e   o c c u p a t i o n   i n which he is employed;  (4) the total daily and total weekly hours worked,  showing the beginning and ending time of each work period, computed to the nearest unit of 15 minutes;  (5) his total hourly, daily or weekly basic wage;  (6) his overtime wage as a separate item from             his basic wage;   (7) additions  to  or  deductions  from  his  wages  each pay period;  (8) his total wages paid each pay period;  (9) such  other  records  as  are  stipulated  in accordance with  sections 31-60-1 through 31-60-16;  (10)       working  certificates  for  minor  employees (sixteen  to  eighteen  years). True  and accurate records shall be maintained and retained at the place of employment for a period of 3 years for each employee. (1) works  an  undue  hardship  on  the  employer without materially benefiting the inspection procedures of the labor department, or(2) is  not  practical  for  enforcement  purposes. Where  permission  is  granted  to  maintain wage  records  at  other  than  the  place  of employment,  a  record  of  total  daily  and weekly  hours  worked  by  each  employee shall  also  be  available  for  inspection  in connection with such wage records. (c) In the case of an employee who spends 75% or more of his working time away from his employer’s place  of  business  and  the  maintaining  of  time records showing the beginning and ending time of each work period for such employee either imposes an  undue  hardship  upon  the  employer  or  exposes him  to  jeopardy  because  of  his  inability  to  control the accuracy of such entries, a record of total daily and total weekly hours will be approved as fulfilling the  record  keeping  requirements  of  this  section. However,  in  such  cases,  the  original  time  entries shall  be  made  by  the  employee  in  his  own  behalf and  the  time  entries  made  by  the  employee  shall be used as the basis for payroll records. (d)  The  employer  shall  maintain  and  retain  for  a period  of  3  years  the  following  information  and data  on  each  individual  employed  in  a  bona  fide executive, administrative or professional capacity. (1) His name;(2) his home address;(3) the occupation in which he is employed;(4) his total wages paid each work period;(5) the date of payment and the pay period covered by payment. Sec. 31-60-14. Employee in a bona fide Executive capacity. time  by  the  labor  commissioner  upon  proper notice, if he finds that the intent of the program as approved  has  not  been  carried  out. An  employee who is compensated on a salary basis at a rate of not  less  than four  hundred  seventy-five  dollars per  week,  exclusive  of  board,  lodging,  or  other facilities,  and  whose  primary  duty  consists  of the  management  of  the  enterprise  in  which  he  is employed or of a customarily recognized department or subdivision thereof, and includes the customary and regular direction of the work of two or more other employees therein, shall be deemed to meet all of the requirements of this section. (b) “Salary basis” means a predetermined amount paid for each pay period on a weekly or less frequent basis,  regardless  of  the  number  of  days  or  hours worked,  which  amount  is  not  subject  to  reduction because  of  variations  in  the  quality  or  quantity  of the  work  performed,  and  which  amount  has  been the subject of an employer advisement as required by  section  31-71f  of  the  Connecticut  General Statutes. (E)  Deductions  may  be  made  for  one  or  more full days if the employee is absent as a result of a disciplinary suspension for violating a safety rule of major significance. Safety rules of major significance  include  only  those  relating  to  the prevention of serious danger to the employer’s premises, or to other employees. (2)(A) No deduction of any kind shall be made for any part of a workweek absence that is attributable to:(i) lack of work occasioned by the operating requirements of the employer;(ii)  jury  duty,  or  attendance  at  a  judicial proceeding in the capacity of a witness; or(iii) temporary military leave. (B) An employer is permitted to offset payments an  employee  receives  for  any  of  the  services d e s c r i b e d   i n   t h i s   s u b d i v i s i o n   a g a i n s t   t h e employee’s  regular  salary  during  the  week  of such absence. (B)  The  absence  is  taken  pursuant  to  a  bona fide  paid  time  off  benefits  plan  that  specifically authorizes  the  substitution  or  reduction  from accrued benefits for the time that an employee is  absent  from  work,  provided  the  employee receives  payment  in  an  amount  equal  to  his guaranteed salary. (4) No deduction of any kind shall be made for an absence of less than one week which results from a disciplinary suspension for violating ordinary rules of employee conduct. Sec. 31-60-15. E m p l o y e e   i n   b o n a   f i d e Administrative Capacity. facilities, or (B) who, in the case of academic administrative  personnel,  is  compensated  for his services as required by subparagraph (A) of this subdivision or on a salary basis which is at least equal to the entrance salary for teachers in the school system or educational establishment or institution by which he is employed; provided an employee who is compensated on a salary or  fee  basis  at  a  rate    of  not  less  than four hundred  seventy-five  dollars  per  week, exclusive of board, lodging, or other facilities, a n d   w h o s e   p r i m a r y   d u t y   c o n s i s t s   o f   t h e performance of work described in subdivision (1) of this section, which includes work requiring the  exercise  of  discretion  and  independent judgement, shall be deemed to meet all of the requirements of this section. (c)  “Fee  basis”  means  the  payment  of  an agreed  sum  for  the  accomplishment  of  a single task regardless of the time required for its  completion. A  fee  basis  payment  shall  be permitted  only  for  jobs  which  are  unique  in nature rather than for a series of jobs which are repeated an indefinite number of times and for which  payment  on  an  identical  basis  is  made over and over again. Payment on a fee basis shall amount to a rate of not less than the rate set forth in subsection (a) of this section. Sec. 31-60-16. Employee  in  bona  fide Professional Capacity. (a) For the purposes of said section 31-58 (f) “employee employed in a bona fide professional capacity”  means  any  employee  (1)  whose primary  duty  consists  of  the  performance o f :     ( A )   w o r k   r e q u i r i n g   k n o w l e d g e   o f   a n advanced type in a field of science or learning customarily acquired by a prolonged course of specialized  intellectual  instruction  and  study, as  distinguished  from  a  general  academic education  and  from  an  apprenticeship,  and from  training  in  the  performance  of  routine mental, manual, or physical processes, or (B) work  that  is  original  and  creative  in  character in  a  recognized  field  of  artistic  endeavor,  as opposed  to  work  which  can  be  produced  by a  person  endowed  with  general  manual  or intellectual  ability  and  training,  and  the  result of  which  depends  primarily  on  the  invention, imagination  or  talent  of  the  employee  or  (C) teaching, tutoring, instructing or lecturing in the activity of imparting knowledge while employed and engaged in this activity as a teacher certified or recognized as such in the school system or educational  establishment  or  institution  by which  he  is  employed;  and  (2)  whose  work requires  the  consistent  exercise  of  discretion and  judgement  in  its  performance;  and  (3) whose work is predominantly  intellectual and varied  in  character,  as  opposed  to  routine m e n t a l ,   m a n u a l ,   m e c h a n i c a l   o r   p h y s i c a l work, and is of such character that the output produced  or  the  result  accomplished  cannot be  standardized  in  relation  to  a  given  period of  time;  and  (4)  who  does  not  devote  more than  twenty  percent  of  his  hours  worked  in the  workweek  to  activities  which  are  not  an essential  part  of  and  necessarily  incident to  the  work  described  in  subdivision  (1)  to (3),  inclusive,  of  this  section;  and  (5)  who  is compensated for his services on a salary or fee basis at a rate of not less than four hundred  dollars per week exclusive of board, lodging, or  other  facilities;  provided  this  subdivision shall not apply in the case of an employee who is  the  holder  of  a  valid  license  or  certificate permitting the practice of law or medicine or any of their branches and who is actually engaged in  the  practice  thereof,  or  in  the  case  of  an employee  who  is  the  holder  of  the  requisite academic  degree  for  the  general  practice  of medicine  and  is  engaged  in  an  internship  or resident  program  pursuant  to  the  practice  of medicine or any of its branches, or in the case of  an  employee  employed  and  engaged  as  a teacher  as  provided  in  subdivision  (1)  (C)  of this section, and provided an employee who is compensated on a salary or fee basis at a rate of  not  less  than four  hundred  seventy-five dollars per week exclusive of board, lodging or other facilities, and whose primary duty consists of  the  performance  either  of  work  described in  subdivision  (1)  (A)  or  (C)  of  this  section which  includes  work  requiring  the  consistent exercise  of  discretion  and  judgement,  or  of work requiring invention, imagination or talent in a recognized field of artistic endeavor, shall be deemed to meet all of the requirements of this section. (c)  “Fee  basis”  means  the  payment  of  an agreed  sum  for  the  accomplishment  of  a single task regardless of the time required for its  completion. A  fee  basis  payment  shall  be permitted  only  for  jobs  which  are  unique  in nature rather than for a series of jobs which are repeated an indefinite number of times and for which  payment  on  an  identical  basis  is  made over and over again. Payment on a fee basis shall amount to a rate of not less than the rate set forth in subsection (a) of this section.